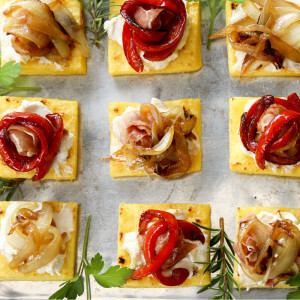 Even if you don't "get" regular polenta, you will surely "get" this four-cheese indulgence. It is the mac & cheese of polenta. This recipe comes from Dean & Deluca: The Food and Wine Cookbook. I serve it as the underpinnings for their Wild mushroom stew with a handful of arugula to make sure I include something green in the meal. It is good with any stew or marinara sauce. 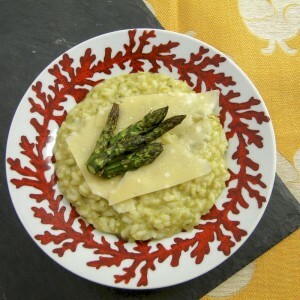 In this recipe, I use gorgonzola, parmigiano reggiano, fontina and goat cheese. 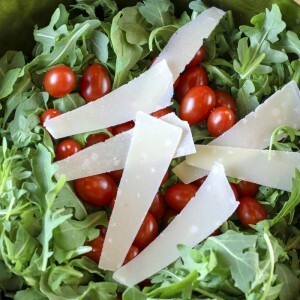 You can use a variety of cheeses, including: mascarpone, ricotta, cheddar, brie, Camembert or whatever suits your fancy. This recipe uses instant polenta, which takes just a few minutes because it has been pre-cooked and dried, similar to instant oatmeal. The brand I use is Polenta Valsugana, an Italian brand. If you use a different brand, follow the packaged directions. True polenta takes about 45 minutes to cook and requires quite a bit of stirring and vigilance, but is great for toning your granny flaps. Making polenta from scratch is worth the upper body workout, but when we don't have the time or energy, instant polenta will fill the bill, particularly when doctored up with great cheese. More on polenta in an upcoming post. As it cools, polenta will quickly form into whatever shape container it is in. If you are lucky enough to have any leftover polenta, spread it in the bottom of a loaf or cake pan so it is about 3/4' thick. The next day you can cut slices from the pan and grill or fry them. The mac & cheese of polenta. This is a wonderful foundation for Wild mushroom stew, marinara sauce or any hearty stew or pasta sauce. Bring milk, water and butter to a boil in a saucepan. Stir in polenta. Reduce heat and continue to to cook for about 6 to 7 minutes. Remove from heat and stir in cheeses and season with salt and pepper. Serve immediately.